South Bass Island. Put-in-Bay. Learn these names now: you will be hearing them many, many times before this album is over. 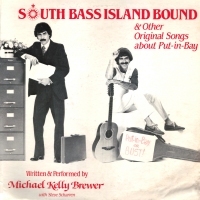 If South Bass Island is, as Wikipedia states, the "Key West of Southern Lake Erie", then Michael Kelly Brewer is Southern Lake Erie's answer to Jimmy Buffett. He's got a collection of cheery songs (well, okay, "I Knew You" is kind of a downer) all about island living, escaping the rat race, and getting wasted on that fine Ohio wine. I'm assuming this album was sold in souvenir shops all over the island. I wasn't able to find any current info about Mr. Brewer, but there's a nice smartass Q&A session with him printed on the back of the jacket. 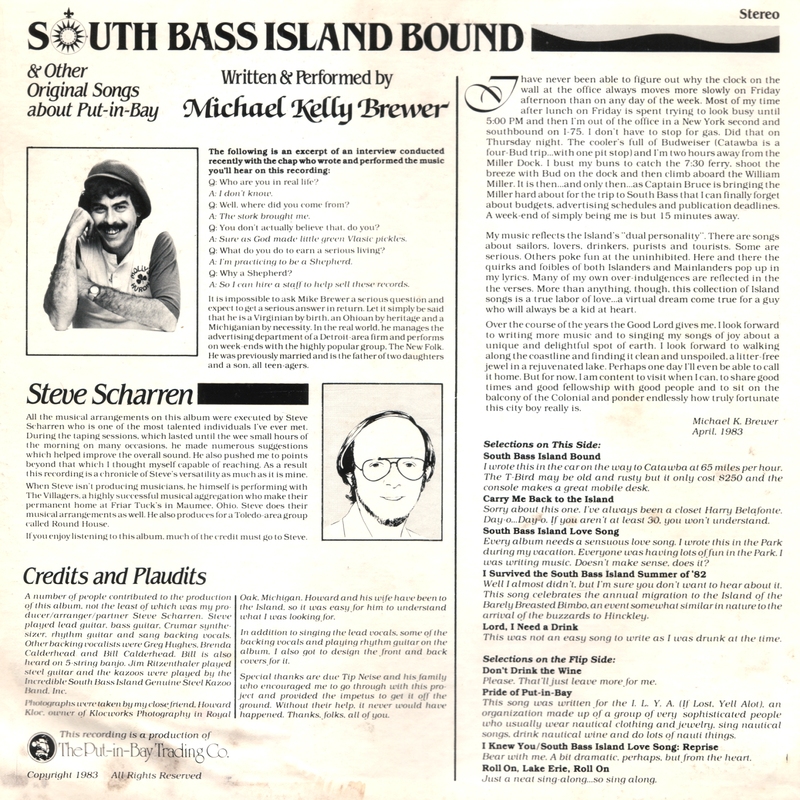 His arranger/producer, Steve Scharren, appears to still be active in music, both as a sound engineer and as a performer. howdy! this mp3 page is one of the greatest on earth (http://blog.wfmu.org/freeform/mp3s/index.html). I think there should be a radio station that exclusively plays Michael Kelly Brewer. Had I known that my father's music would end up in digital form on the internet, I would have saved 200 bucks and not purchased the lp converter to mp3, however I am tickled that someone has tracked it down and saved it for posterity. You had mentioned an interest toward learning more about his past, and even though I don't know what your motive is, I am happy to provide it. My father died of cancer in 1996 and spent most of his adult life playing music in some form on weekends his entire life. He and his brother Pat grew up together playing in Galion, Ohio and surroundings and was a radio disc jockey for his early life. In Findlay Ohio he began playing in a band called the New Folk, which played every Friday and Saturday at Petty's Alpine Village in Findlay, and hooked up with some others at Friar Tucks in Maumee, Ohio. He did this for most of the 70s, playing 12-string and six-string acoustic guitar, singing lead, accompanied by bass and banjo and later keyboards. Early days were influenced by a lot of the clean folk acts of the early 60s, however the New Folk's act was known for a combination of good folk harmony, ribald songs, and lots of sing a longs. You might be able to track down the people from the New Folk, if you are interested, because they are probably still around Nortwest Ohio. They made several wonderful albums, including a live one with my father. Bill and Carl Calderhead, although I think Carl passed as well. Brenda Carlhead, I believe was Bill's wife. Not sure where they were. I'd like to find them, because his early work was his best, and I have none of it. My father's homage to Put-in-Bay never really made it that far, as much as I can remember. I am not even really certain if he ever got to play those songs live. He played at the Beer Barrel as an opener for Pat Dailey for a long time however I think he left Ohio/Michigan shortly after it was recorded and moved to Raleigh, NC, which is where he died. I don't think he ever played live again in the 90s, however I could be wrong. He married a woman and they together had a daughter who is now in college. I am pretty certain he met her at one of his performances. I was in my teens at the time, and didn't pay much attention to the music. My father was a very talented performer and great entertainer. He had a wonderful voice, and although he was not nearly the musician that the others in the New Folk were, he certainly was the headliner. The SBIB album is not the style that my father should be remembered for, because he was a much better songwriter than was represented on that album. There is no real consistent style on that album (calypso, pop, ballads) that is indicative of the work with the New Folk, which can be characterized by great vocal harmonies, and finely blended instrumentation - like a bunch of good friends playing together. The closest to that style might be "I survived the summer of 82". SBIB is a fun album to listen to, however it is sad in a sense because my father was much better as the leader of a finely tuned group, rather than as a glossed solo act. Without going into detail, perhaps there is a reason for that. I think it is very nice that my dad's music is available for any one to find now. I am sure he made a lot of people happy in his day, and maybe you got a chance to see him long ago. The internet has a funny way of memorializing and creating myths, and it made me smile to see that someone found his album and recognized him as the "Jimmy Buffett" of Put-in-Bay. He would have been proud of that. If he lived the rest of his life a little differently, he certainly could have laid claim to that honor. Lots of hard years took him in 1996, but I don't think he had too many regrets. I hope that helps you fill in the blanks. You are more than welcome to share this information. It was nice reading this shot from the past. My wife, Cathie, and I spent an evening almost every weekend at the Alpine enjoying the New Folk; Bill, Mike, & Carl. Then when Carl left the group a youngster whose name we can't remember joined & did a fantastic job of Piano Man. We still miss the New Folk!